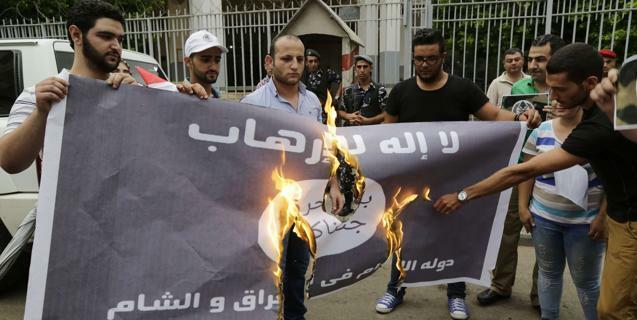 The #BurnIsisFlagChallenge’ reportedly started several days ago by some teenagers in Lebanon has apparently brought about the first response by the Islamist terrorist group which reportedly has kidnapped fifty Iraqi villagers who burned the ISIS flag. Sarhan goes on to report that clans in the area are planning to attack ISIS if the kidnapped villagers are not released. For those who want to join the #BurnIsisFlagChallenge, here is a simple how to video. Just print out an image of the flag and ignite. If you choose to do so indoors like the person seen in the video to avoid being kidnapped and losing your head to an ISIS terrorist, please be careful not to burn your house down. And don’t worry about offending Muslims. This is not the same as burning a Koran. It’s like burning the Nazi or Soviet flags.